Given that there are around 6,000 tweets every second (i.e. over 350,000 tweets per minute, 500 million tweets per day equaling approximately 200 billion tweets per year), it would be great if we could search for those related to a specific subject rather than an avalanche of tweets we’re not interested in. Good news! 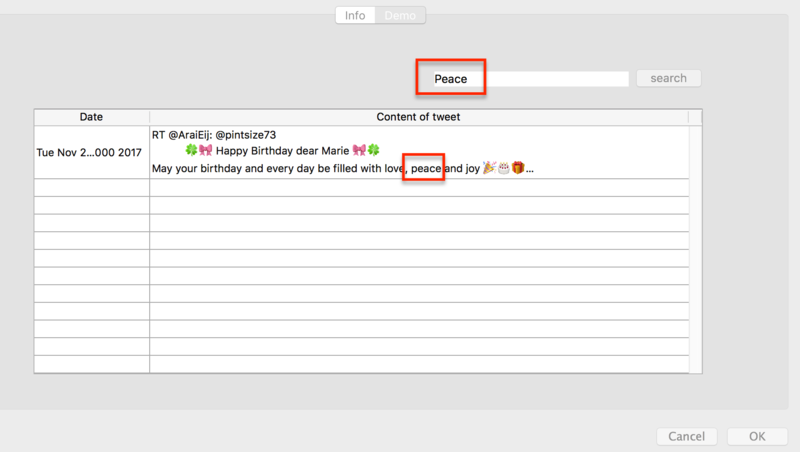 Twitter provides a REST Search API that is great for searching tweets. 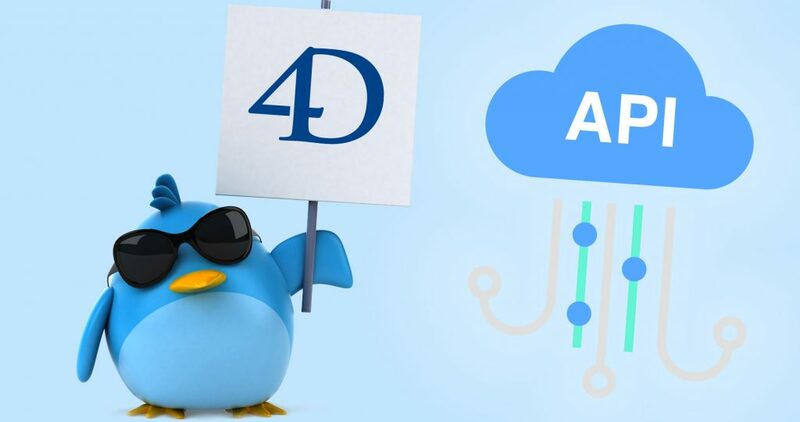 In this post we’ll discuss how to use Twitter’s Search API with 4D (Jump to the database example). Create a Twitter account (if you don’t already have one). Go to https://dev.twitter.com/apps/new and log in. Click the “Create New App” button, fill out the form, agree to the terms and click the “Create your Twitter application” button. Next, on the “Keys and Access Tokens” tab, copy your “API key” and “API secret”. Note: These tokens should be considered as sensitive as passwords and must not be shared or distributed to untrusted parties. encode its consumer key and secret. 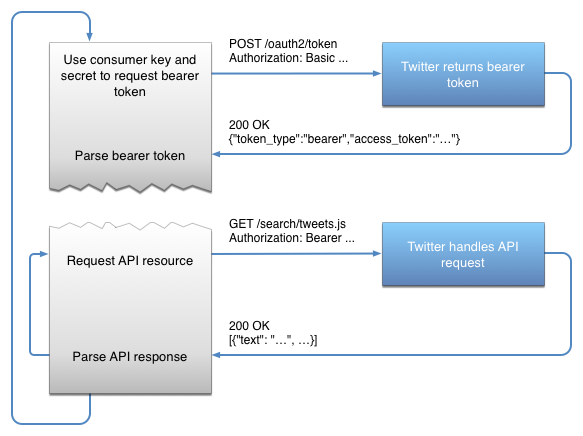 make a request to the POST oauth2 / token endpoint to exchange these credentials for a bearer token. use this bearer token for authentication when accessing the REST API. Concatenate the consumer key and the encoded consumer secret into a single string with a colon character ”:”. Convert your string into a BLOB with the TEXT TO BLOB command. Encode the blob with the BASE64 ENCODE command. The resulting value must be exchanged for a bearer token by issuing a request to POST oauth2 / token. This request is made with the 4D HTTP Request command and the HTTP POST method selector. It must include an Authorization header and a Content-Type, with the body of the request as grant_type=client_credentials. Parse the HTTP response with the JSON Parse command, then store the value of the access_token property into a variable. This bearer token will be used to issue a request to our search API (details in search for tweets section). So copy it and keep it close. 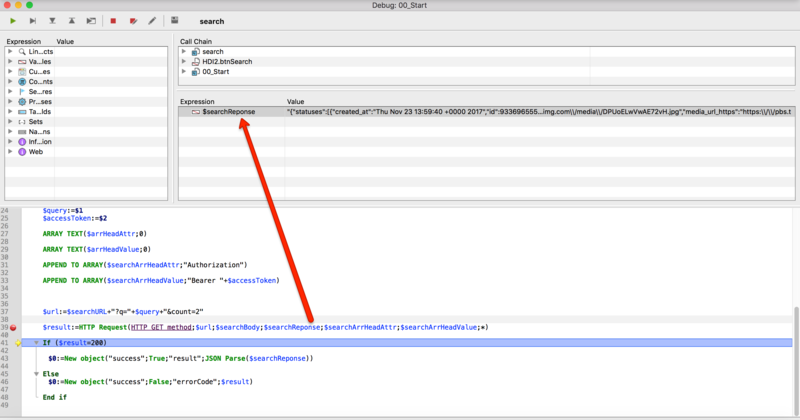 $accessToken:="Your access token from the authentication section"
In the debugger, drag your $searchResponse variable into the Expression window, and you’ll notice that the result contains keywords matching our query. Check out our application example! Please note that this example requires that you follow some of the steps described. In fact, you will need to get your twitter access tokens to run the demo.